to make sure procurements are statutorily compliant, appropriately competitive, and provide the best value for the goals of the agency. Fiscal years 2016, 2017, and 2018, TFC spending was $175M,$387M, and $446M respectively, per year in a variety of categories. Architects, engineers, general contractors, plumbers, and a variety of maintenance services are required to keep state buildings open for business. Technology is essential, as are tools, parts, and supplies. Procurement supports the Texas economy and helps businesses grow. TFC’s procurement processes encourage competition for even the smallest of purchases. Small businesses, including Historically Underutilized Businesses, are encouraged to participate in solicitations. 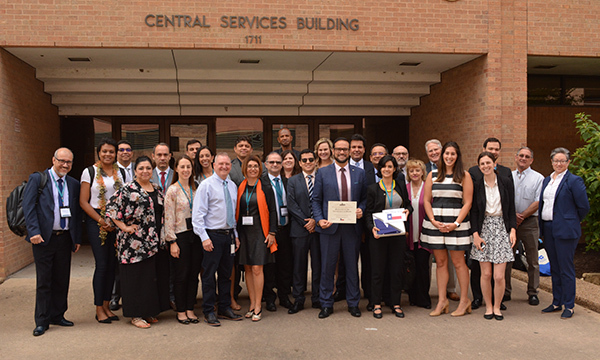 The Texas Facilities Commission hosted a delegation from the Republic of Panama, on February 9, 2017. The Panamanian government delegation was interested in learning about state procurement and surplus processes. 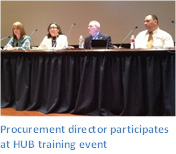 Top agency staff presented on a variety of topics including construction procurement, space and building management, competitive solicitation, state of Texas procurement practices, Historically Underutilized Business (HUB), and surplus property management. This was the second visit from an international government requested to visit TFC by the United States Trade and Development Agency; in December 2014 TFC presented similar material to a delegation from the Republic of Botswana. *The information below is provided as a tool to assist potential respondents in preparing a response to TFC advertised solicitations. TFC reserves the right to alter, modify, combine, or delete any components of the forecast, including budget, description, and/or projected posting date. TFC anticipates providing a forecast for Construction Manager at Risk (CMR) solicitations for each of the A/E listed projects as soon as can be formulated. Repairs to mechanical, electrical and security systems. Maintenance and repair services for the Siemens Apogee Building Automation System. Maintenance services of existing access control and surveillance equipment.